Iraqi forces, joined by a Shi'ite militia coalition and a US-air campaign, thrust into the northern outskirts of Falluja as part of an assault to retake the city from Islamic State. 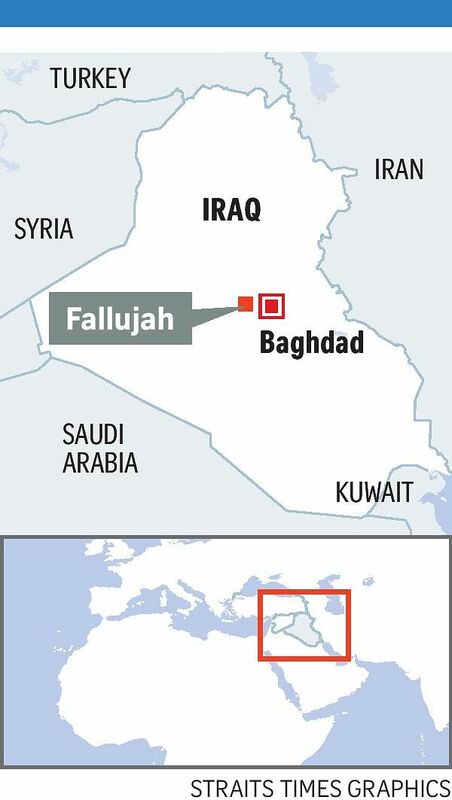 BAGHDAD• • Fears were mounting for tens of thousands of civilians trapped in the Iraqi city of Fallujah as the army entered the final phases of an operation to retake what was once a bastion of the militant Islamic State in Iraq and Syria (ISIS). Refugee officials spoke of ISIS fighters using civilians as shields. Norwegian Refugee Council secretary-general Jan Egeland renewed a call for safe corridors to be opened to prevent mass civilian deaths. "A human catastrophe is unfolding in Fallujah. Families are caught in the crossfire with no safe way out," he said in a statement. Iraqi forces faced tough resistance from ISIS as they tried to enter the centre of Fallujah yesterday. After thrusting into the city from three directions on Monday, their biggest advance was from the south, where they pushed into the suburb of Naimiyah. Lieutenant-General Abdelwahab al-Saadi, the commander of the Fallujah operation, said ISIS fighters had mounted a fierce counterattack in the area. "There were around 100 fighters involved. They came at us heavily armed but did not use car bombs or suicide bombers," he said. Lt-Gen Saadi said Iraqi forces, which include police and army units, were eventually able to repel the attack, killing 75 terrorists. He gave no figure for losses on the progovernment side. Provincial councillor Rajeh Barakat said the Iraqi forces had now resumed their advance from Naimiyah. A Fallujah resident said many civilians were eager to see the security forces recapture the city, but there were fears of what the Islamists might do as defeat loomed. "There is some discontent among the people because we haven't seen the Iraqi forces enter the centre yet," said the resident, who gave his name as Abu Mohammed al-Dulaimi. "Their treatment of the people is getting worse every day. There is a feeling of panic among them, it seems. Daesh is angry because they don't feel supported and they have been seen insulting people on the streets, shouting things like 'cowards, you are not with us'." Daesh is a derogatory Arabic term for ISIS. The situation facing residents, stuck between the intensifying bombardment by pro-government forces and the increasingly desperate Islamists, was worse than ever, Mr Dulaimi said. "Yesterday, they (ISIS) were rounding up young men from several parts of the city - we think maybe around 100 of them - and taking them to an unknown location," he said. Iraqi officers said ISIS has been forcibly recruiting men and boys. The Islamists are also holding several hundred families as "human shields", the United Nations refugee agency said yesterday, citing witness accounts. The accounts come from displaced people who have spoken to United Nations High Commissioner for Refugees field staff, spokesman Ariane Rummery said. "Most people able to get out come from the outskirts of Fallujah. For some time, militants have been controlling movements, we know civilians have been prevented from fleeing," Ms Rummery said. Meanwhile, in Syria, US-backed Kurdish-led fighters have seized ground from ISIS near the militant group's stronghold of Raqqa, a monitoring group said yesterday. "The Syrian Democratic Forces have captured 12 villages... north-west of Raqqa in the past 36 hours," Syrian Observatory for Human Rights chief Rami Abdel Rahman said.